Westerville, OH, June 09, 2017…A ribbon-cutting ceremony facilitated by the Shelby County Chamber of Commerce was held June 9 at Brea’s Crossing at 3025 Squire Circle, Shelbyville. The new community is a $6.2 million development offering 24 one-bedroom and 20 two-bedroom, garden-style units with private entrances and single car garages. The attractive apartment homes at Brea’s Crossing were built using the latest green construction techniques with an open concept design, individual heating and cooling systems, energy-saving windows and appliances, plus cable and washer/dryer hookup, additional outside storage. Site amenities include a community room with kitchenette, an exercise room, laundry facilities and a community garden. An on-site property manager is available. Brea’s Crossing resident Carolyn Thomas also spoke at the property’s ribbon-cutting ceremony. “I can’t imagine anybody not wanting to live here,” Thomas said, adding that she especially appreciates the accessibility, affordability and Kentucky location of Brea’s Crossing. Funding for Brea’s Crossing was supported by federal housing tax credits administered by Kentucky Housing Corporation, explains Stansbury. 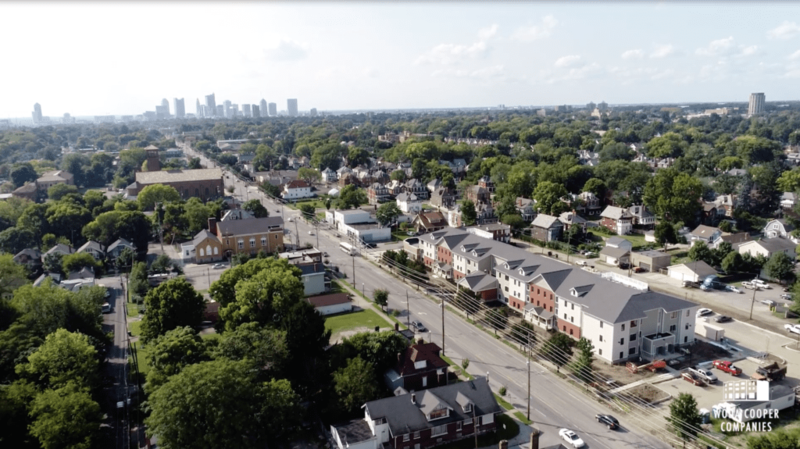 The Ohio Equity Fund for Housing Limited Partnership XXV was the primary equity investor with additional investments by OEF Investment Fund LLC and RiverHills Bank. The Woda Group, Inc. and its affiliates are experienced developers, general contractors, and property managers specializing in the design, construction, and management of affordable multi-family apartments, senior communities, and single-family homes. Considered leading experts in the affordable housing industry, the Woda team is known for producing and maintaining high quality affordable housing. Affordable Housing Finance Magazine ranked The Woda Group, Inc. 9th overall among Affordable Housing Developers and 22nd overall among Affordable Housing Owners in its April/May 2017 issue. The Woda Group, Inc. has developed and currently manages over 275 communities and over 10,000 units. #1: From left: Natalie Mudd, President of the Shelby County Chamber of Commerce; Rob Ellis, Deputy Executive Director, Kentucky Housing Corporation; Brian Dunlap, President and Chief Executive Officer of RiverHills Bank; David Cooper, Principal of The Woda Group, Inc.; Representative Rob Rothenburger, Kentucky House District 58; Brea Stansbury (property namesake); Dan Ison, Shelby County Judge Executive; Tammy Stansbury, Vice President of Development, The Woda Group, Inc.; John Kircher, Senior Vice President, Development, Ohio Capital Corporation for Housing; and John Wieland, Executive Director, Shelby County Chamber of Commerce. #2 Tammy Stansbury, Vice President of Development, The Woda Group, Inc.